Walk safely with ease on ice and snow! No-slip studded shoe ice cleats have 4 stainless steel cleats to firmly grip icy surfaces and packed snow. 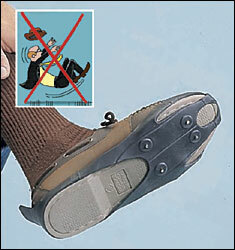 Ice cleats fit any shoe or boot to prevent falls; slip on in seconds. Women's fit shoe sizes 5-10; men's fit 6-11. Pair tucks in the resealable pouch to take along for sure-footed security. Women's ice cleats fit women's shoe sizes 5-10, men's sizes 3-8. Men's ice cleats fit women's sizes 8-12, men's sizes 6-11. We recently had an ice storm, and my son-in-law has already fallen once. These cleats are for them. I have a pr. and they work well. I may need this during the winter months so I'm trying to be prepared for inclement weather.